The workplace and the way we work are constantly evolving. We are often therefore looking at ways in which to create new spaces within existing environments to adapt to these changes. One of the main issues we face adopting and working within an open plan environment are noise levels making it difficult for individual workers to concentrate on basic tasks such as making a phone call or working independently. We must learn to identify these areas within the work place and cater for those who would find themselves being more productive working within a more secluded or private area. 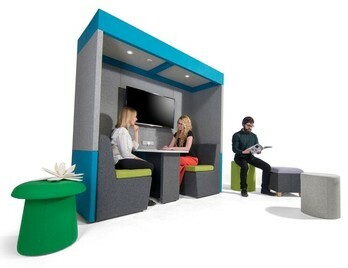 We can address these open-plan probelms or 'head aches' by the introduction of acoustic booths. 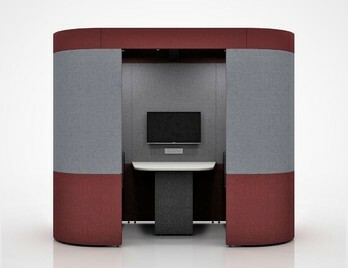 Work safely and in private with these stylish acoustic cocoon BuzziBooth's. 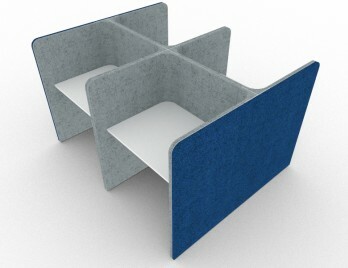 Work within the booth made of sound absorbing felt that dampens outside sounds. You can now have a moment alone away from the hustle and bustle of the surrounding workplace and environment. 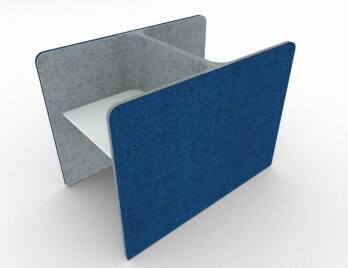 There are many different colour and styles of felt to choose from making it easy to customise your own style of booth, you may find it hard to leave! Delivery is free to mainland UK. 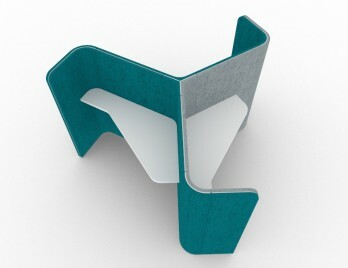 This double dining pod has been tested and proven to give a noise reduction. The two adjacent pods come to have the choice of optional power points. 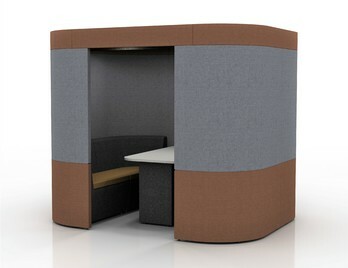 Each pod is a great way to partition bigger rooms into smaller sections and is available in a choice of colours. The BuzziHub is designed to be a central social point in the office where people can come together to meet, talk, discuss and share information creating a vibrant and friendly working environment. It has been designed to make you feel at home by creating a warm and comfortable environment to facilitate communication and improve personal wellbeing. BuzziHub has optional extras such as lights, armrests and cushions to make yourself feel a little more at home. 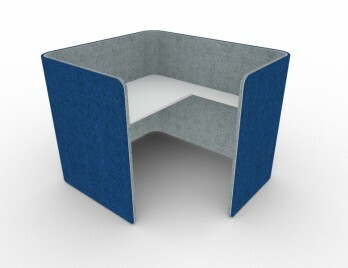 The Cypher Solo booth a noise barrier, acoustically enhanced to separate you from the acoustic hustle and bustle of the workplace. These booths due to the unique junction system can be configured in numerous ways and are available at various heights and widths. The Cypher range also extends from the solo booth to booths of up to eight workstations and can also feature power, reading lights and data connectivity. 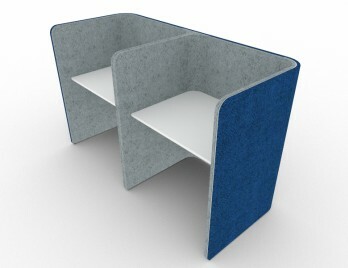 The Cypher Booth 120 is an acoustically enhanced workstation island designed to offer an inviting touchdown work area for up to three people amongst the hustle and bustle of the workplace. 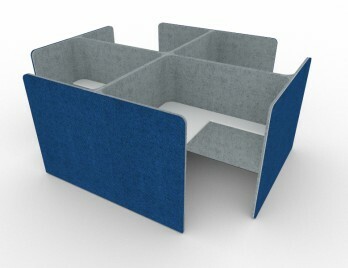 The configuration takes up less space than a standard three-person pentagon desk set up so is an attractive option for those offices with restricted space. 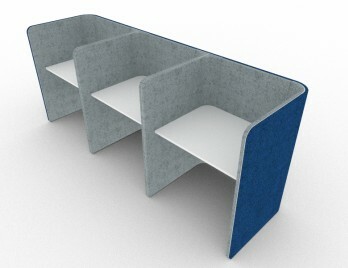 These Booths due to the unique junction system can be configured in numerous ways and are available at various heights and widths with further options on the fabric finishes and properties. 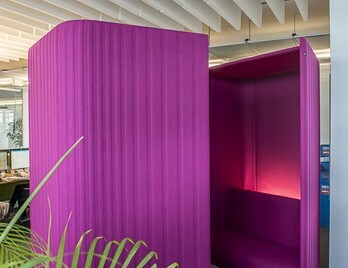 The Cypher Honeycomb Solo booth a noise barrier, acoustically enhanced to separate you from the acoustic hustle and bustle of the workplace. These booths due to the unique junction system can be configured in numerous ways and are available at various heights and widths. 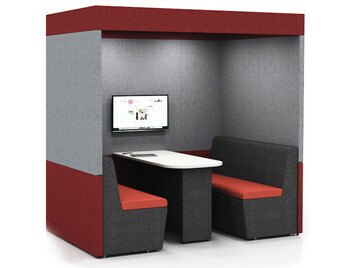 The Cypher Honeycomb range also extends from the solo booth to booths of up to six workstations. This range takes its inspiration from our childhood desire to create our own quiet space through Den building. The Cypher Cube 1 booth a noise barrier, acoustically enhanced to separate you from the acoustic hustle and bustle of the workplace. 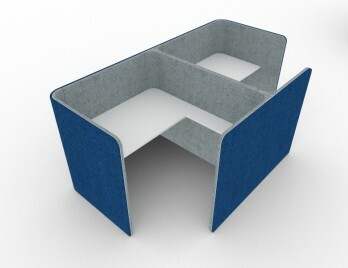 These booths due to the unique junction system can be configured in numerous ways and are available at various heights and widths. The Cypher range also extends from the solo booth to booths of up to eight workstations and can also feature power, reading lights and data connectivity. 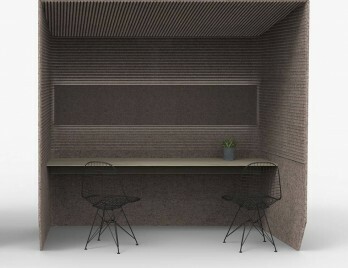 The Cypher 4 booth is a noise barrier, acoustically enhanced to separate workers from the acoustic hustle and bustle of the workplace. These booths due to the unique junction system can be configured in numerous ways and are available at various heights and widths. 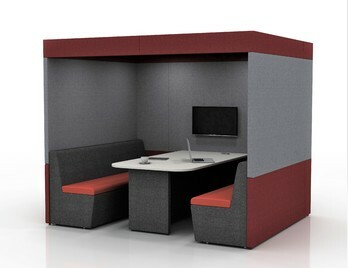 The Cypher range also extends from the solo booth to booths of up to eight workstations and can also feature power, reading lights and data connectivity. The Cypher 2 booth a noise barrier, acoustically enhanced to separate workers from the acoustic hustle and bustle of the workplace. These booths due to the unique junction system can be configured in numerous ways and are available at various heights and widths. The Cypher range also extends from the solo booth to booths of up to eight workstations and can also feature power, reading lights and data connectivity. Zen Twin creates an oasis of space and support for two colleagues wanting to touch down, collaborate or have an informal one to one session. Zen Twin offers an excellent opportunity to collaborate and it can be specified with monitor brackets so you can mount a flat screen adding a more focused and purposeful element to each meeting. Zen Team 6 creates an oasis of space and support for up to six colleagues wanting to touch down, collaborate or have a meeting. Zen Team 6 offers an excellent opportunity to collaborate and it can be specified with monitor brackets so you can mount a flat screen adding a more focused and purposeful element to each meeting. The Zen system is flexible and can easily be modified to fit your space, we can even provide a free site survey and technical drawings prior to ordering. 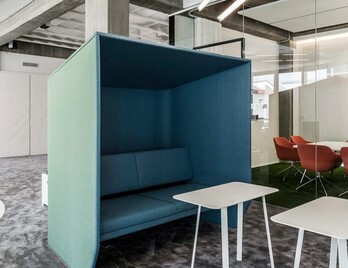 Zen Plus Team 4 creates an oasis of space and support for up to four colleagues wanting to touch down, collaborate or have a meeting. Zen Team 4 offers an excellent opportunity to collaborate and it can be specified with monitor brackets so you can mount a flat screen adding a more focused and purposeful element to each meeting. The Zen system is flexible and can easily be modified to fit your space, we can even provide a free site survey and technical drawings prior to ordering. Zen Team 4 creates an oasis of space and support for up to four colleagues wanting to touch down, collaborate or have a meeting. Zen Twin offers an excellent opportunity to collaborate and it can be specified with monitor brackets so you can mount a flat screen adding a more focused and purposeful element to each meeting. The Zen system is flexible and can easily be modified to fit your space, we can even provide a free site survey and technical drawings prior to ordering. 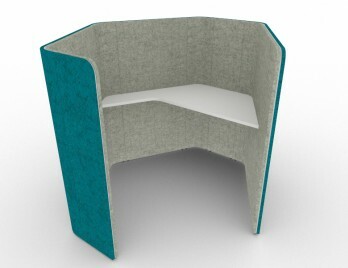 Zen Curve 4 creates an oasis of space and support for up to six colleagues wanting to touch down, collaborate or have a meeting. Zen Curve 4 offers an excellent opportunity to collaborate and it can be specified with monitor brackets so you can mount a flat screen adding a more focused and purposeful element to each meeting. The Zen system is flexible and can easily be modified to fit your space, we can even provide a free site survey and technical drawings prior to ordering. 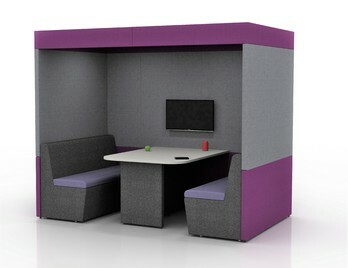 Zen Curve 6 creates an oasis of space and support for up to six colleagues wanting to touch down, collaborate or have a meeting. Zen Curve 6 offers an excellent opportunity to collaborate and it can be specified with monitor brackets so you can mount a flat screen adding a more focused and purposeful element to each meeting. The Zen system is flexible and can easily be modified to fit your space, we can even provide a free site survey and technical drawings prior to ordering. Zen Plus Team 6 creates an oasis of space and support for up to six colleagues wanting to touch down, collaborate or have a meeting. Zen Plus Team 6 offers an excellent opportunity to collaborate and it can be specified with monitor brackets so you can mount a flat screen adding a more focused and purposeful element to each meeting. The Zen system is flexible and can easily be modified to fit your space, we can even provide a free site survey and technical drawings prior to ordering. 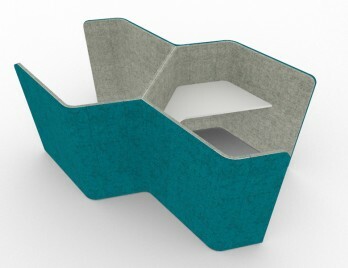 Acoustic booths are easier to configure and shape than pods as they are designed with complete flexibility in mind and can be assembled ‘tool free’ quickly. 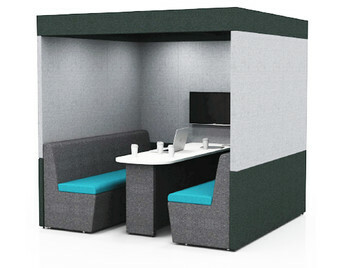 Some booths are open units which means that they do not have a hinged or closing door facility making them inviting and easily accessible for each user or team. However, when more privacy is needed closed booths are the preferred option with some taking the appearance of phone booths or boxes. 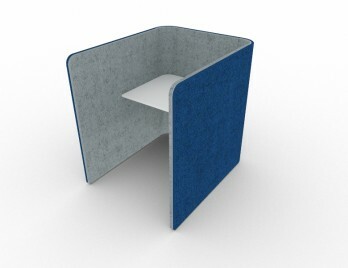 The panels on acoustic booths are around 50mm thick and can be covered in acoustic tested fabric both internally and externally providing peaceful haven for each user. The flexibility of the booths is appealing as they can be relocated quickly with minimum fuss and do not requier building regulations to be sanctioned. 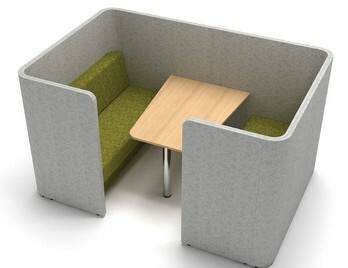 We offer a great selection of acoustic booths for single users, double users and team and meeting. If you need anything more specific to your requirements please do not hesitate to contact us on 01823 663880.